Everton must make a swoop to sign Atlanta United goal machine Josef Martinez in the January transfer window if Marco Silva wants to solve the shortage of goals from his strikers at Goodison Park next month. Martinez, 25, has been in phenomenal form in the US, scoring 34 goals in 38 appearances across all competitions for the MLS Cup finalists. 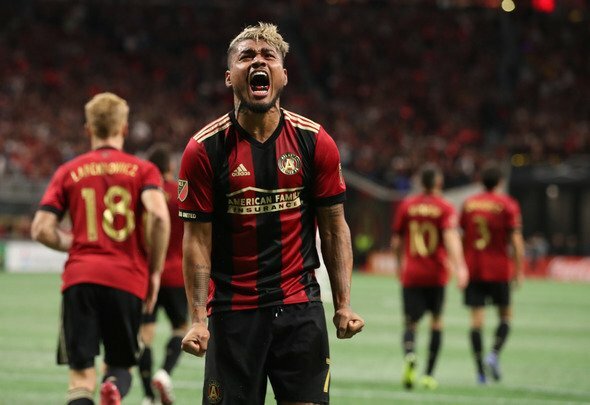 The Venezuela international was named the 2018 MVP on Thursday thanks to his goal scoring exploits for Atlanta – and it is clear now that a side from the Premier League should be taking a look at signing him. Everton have only scored two goals in their last four games and while Richarlison has done well while playing up front, it is clear that he is not an out-and-out striker and Cenk Tosun, Oumar Niasse and Dominic Calvert-Lewin simply aren’t supplying the goals required for a club like the Blues. Silva has a really good chance of leading his side to a sixth-placed finish this season if Manchester United’s woes continue, but he will only do that with someone who can score every opportunity that comes their way spearheading his attack. Martinez has shown in the last year that he is lethal in front of goal. He is lightning-quick, strong, a good team player and is obviously in the form of his life right now. Newcastle, according to US journalist Roberto Rojas, are close to signing Martinez’s Atlanta team-mate Miguel Almiron for what could be a fee of £15million. If Almiron, who has combined superbly with Martinez this season, costs that much, then surely the centre-forward will not cost much more. Silva will have Everton fans salivating if he is able to make this move in the January transfer window. It is not very often you have such an in-form player available for what could be a small fee in terms of Premier League spending. The Toffees cannot pass up on this chance to make what would be a significant addition to their strike force next month.